Spoilers warning: Spoilers for Ancillary Justice and Ancillary Sword. Ancillary Mercy starts right where Ancillary Sword ended, with everyone at and near Athoek Station recovering from the fallout of the events of the previous book. However, Breq knows that her actions will not end up unnoticed for long, and sure enough, Anaander Mianaai shows up in the system in a very bad mood. Meanwhile, there’s still the issue of the ghost system and the missing ancillaries, the intervention with the Presger, and the fate of various people from Ancillary Sword to deal with. I wasn’t sure how Leckie would end up wrapping up this series, given that the second book was so much more scaled down than the first (only involving one system), and this book seemed to be set in the Athoek system as well. I’m very happy with the ending, though – it was well set up in the rest of the series, and thoroughly satisfying. The characters continue to be a delight to read about as they discover things in them they didn’t know they had – especially Breq, but also Tisarwat, Seivarden, and Mercy of Kalr. There is still plenty of tea and personal drama, but there are also some really cool action scenes in space. 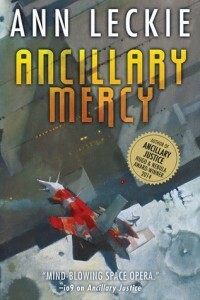 Ancillary Mercy was one of my most anticipated books this year, and it did not disappoint! This series is sadly over, but there’s going to be a new book set in this universe in 2017, and I’m really, really excited about that. This entry was posted in Books, Reviews and tagged book 3, fiction, science fiction by Kriti Godey. Bookmark the permalink.